Your standard outdoor extension cord may have worked well with your string trimmer during the summer, but it will freeze in the winter. When temperatures drop below freezing, regular cords can stiffen, crack or split—making them difficult to control and unsafe to use if the wiring is exposed. People ask us often: "what's the best extension cord for my snowblower?" Although you might see different options around the internet, there's no replacement for an outdoor winter extension cord. Unlike regular outdoor power cords, cold-weather extension cords are heavily insulated to protect against moisture and sub-zero temperatures. They are designed to stay flexible in temperatures as low as -67°F, making them safe and easy to maneuver around the driveway when using your snowblower. It can be confusing trying to find the right size extension cord for your snowblower. You might be asking questions like, "what gauge size do I need?" or "how many amps can my cord handle?" When trying to properly size an extension cord, you need to know how many amps are required to power your equipment and how long your cord needs to be. In the U.S., the standard outlet provides 120V (volts) of power, and there are limitations to how much power can be drawn from a residential circuit. The standard for most homes is 20 amps, so when using a 15 amp snowblower, make sure nothing else is plugged into the circuit or you may trip your breaker box. 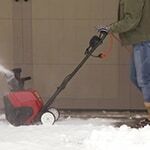 An electric snowblower will have a power rating measured in amps (e.g. 12A). Your winter extension cord needs to be able to handle the rated amps of your snowblower. The numbers don't need to match exactly, but generally, a 12-gauge cord 50'-100' long will safely handle equipment using 10-15 amps of power. 2. What Gauge Does My Extension Cord Need to be? The wire gauge (GA) determines the thickness of the copper wire inside the wire casing, which relates to how much power the cord can carry. Opposite of what you'd think, the smaller the gauge number is, the thicker the wire, and a thicker wire can carry more electricity (amp power). 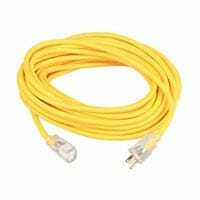 14 gauge cords are meant for light/medium duty applications and will generally handle up to 10 amps of power for cords up to 100 feet. These are not generally recommended for snowblowers. It's a safer bet to use a 12GA cord. 12 gauge cords are used in heavy-duty applications and can generally handle loads of 10-15 amps up to 100' cord lengths. Just remember that an ordinary 12GA cord will still freeze outside—you still need an extension cord rated for cold weather. 3. What Length Cord Do I Need? Make sure that the cord you choose is long enough to extend to the end of your driveway or sidewalk while still maintaining minimum amperage required by your snowblower. Keep in mind that you will lose some power with longer cords, and multiple connections to the outlet to reduce power even more. Power diminishes through your extension cord the further it travels. "Voltage drop" occurs because electricity naturally faces resistance as it moves through the cord. For example, a 25-foot, 12GA cord will lose less power than a 12GA 100-foot cord. Because of this, it's best to choose a cord that's only as long as you need it to be. If you need to control longer cords, be sure to hold it off the ground and are aware of it at all times. Most outdoor cords are brightly colored to make them easy to spot. By following the steps above, you'll get an extension cord that is safe, durable, and conveniently flexible in the coldest, sub-zero temperatures. Now that you've picked a cord that's properly protected from the cold, don't forget to protect yourself! Insulate yourself with layers of winter gear, and dress warmly! Flexible Outdoor Cords.. Our Power Equipment Direct how-to library can help you learn about Top-Rated & Best-Selling Three-Stage Snowblowers, Farmers Almanac Winter Weather Predictions and Proposition 65 Product Labeling.